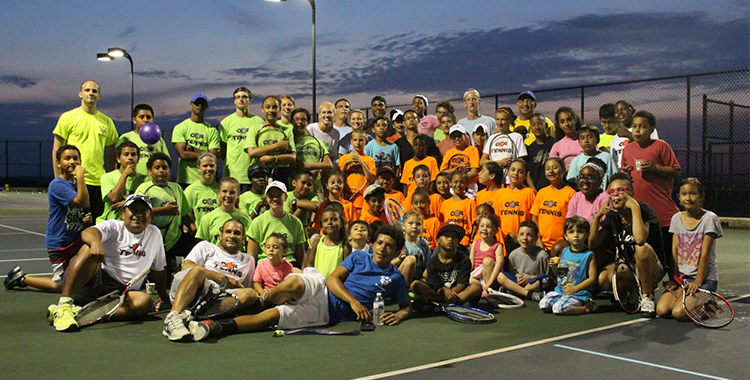 Part of the mission of City of Reading (COR) Tennis is to make tennis available and fun for everyone. Nothing proves that more than “Friday Night Lights,” a program that runs four times throughout the summer. “Friday Night Lights” is a free event for for two and a half hours in Hampden Park. It is very popular among people in the community and runs from 7-9:30 p.m. There is food, tennis and a DJ to provide music throughout the night. Through the program, lots of families in the Reading area have been introduced to tennis, free of cost. This Friday, August 7 is the final “Friday Night Lights” of the summer. Want to attend? Just show up. More information about COR Tennis can be found on their website. COR Tennis is a 2015 Middle States Premier Provider. Every year, Middle States recognizes the facilities and organizations that excel in providing many of the adaptations and programs the USTA offers for its communities. Click here to learn more about Premier Providers.